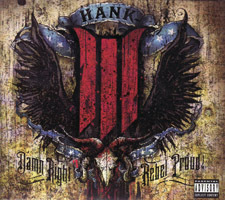 Hank III, the grandson of country legend Hank Williams, Sr. and the son of the country musician Hank Williams, Jr. is a bit of a black sheep in country music. I first heard about him in a danish country television documentary that also featured the awesome and legendary cow punk band Jason and the Scorchers. This album from 2008 is really good and it can be described as traditional country with a certain blend of rock'n'roll and lyrics that touch down on topics like drinking, drugs, fights and poorly paid jobs. The album starts off with an attack on The Grand Ole Opry (country music radio station) and their policies regarding certain musicians not being made members of the hall of fame. Me and my friends is one out of many songs on this album that is about getting drunk, stoned and generally fucked up while still feeling proud of your life and (probably hopeless) situation: Hell we all like to get drunk and fall down all over town you know that each damn day that we're livin we're damn right rebel proud. 3 Shades of Black is a slow and dark song that reminds me a bit of a certain Johnny Cash: 3 shades of black is where I come from. Depression, Missery, and Hellacious fun. No we're not the kind to turn our backs and run, cuz 3 shades of black is where we come from. We are a certain breed and we dont like you. Some are junkies some are freaks and others are everyday ghouls. No one will ever know what we've been through, and we are proud in the light of the moon. 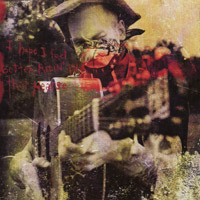 Hank III will be touring Europe for the first time ever in 2009 and I look forward to catch the gig here in Copenhagen later this August. Hank's live gigs usually consist of a traditional country set, a hellbilly set, and a punk/metal set with his band Assjack. Certainly sounds like a thing to see and hear! Hank III and Assjack - Live @ Vega, Photos ♦ Roskilde Festival 2012.